Isn’t it funny how most of us don’t play tourist in our own town? There are so many places and events around us that we always mean to stop and visit, but somehow never do. Well this weekend we checked out a few of those places with my son Alex and his girlfriend Bethany. It all started with something that is all too familiar, however: spending time at Lowe’s and Home Depot to search out stuff for his new house. We looked at bath fixtures, lighting, cabinets and countertops, power tools and … well, you know how it goes when you are fixing up your first house. But heck, we got lunch out of the deal: hot dogs from the AC reps at each store. Actually, the only thing we bought was some shelving at Aldi’s (our favorite place to shop) that was a great deal. Back to playing tourists. 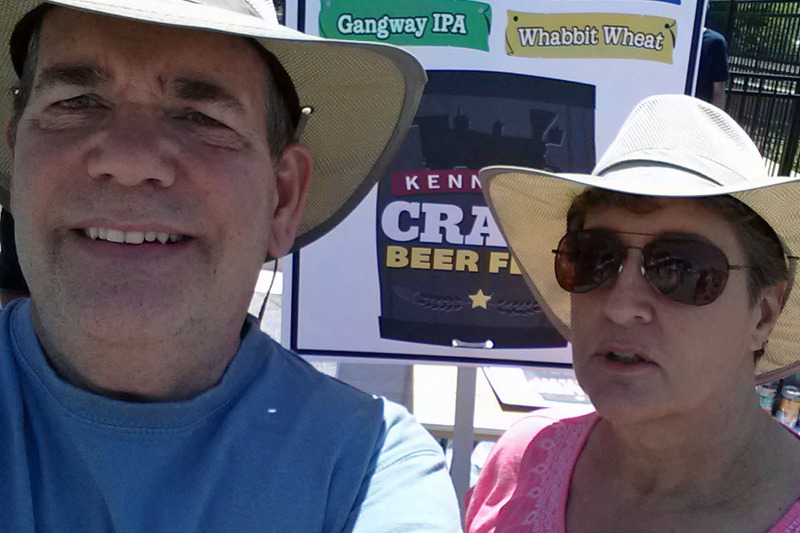 This past May, Jackie and I went to our first beer festival, the Kennesaw Craft Beer Fest. Great day, hot as heck but lots of great sampling of local craft beer (did you even know we HAD local craft and micro breweries?). Represented was the Kennesaw Burnt Hickory Brewery, among others, and I found out that Ale Yeah! was a new shop that had opened in town that featured local brews. So that lingering curiosity finally got us in the door of Ale Yeah!. Little old house that now sports 16 craft beers on tap. If you have kept up with changes in Georgia law and craft brewers, you will know that you can now buy a container (called a growler) of your choice of draft, craft beer and take it home for consumption. Since we couldn’t decide which we would like, we opted for a flight of 4 pours each (little 4 oz. brandy snifter type glasses). We spent the next half hour or so trying to match up the flavors with the names and share our thoughts (peach flavors were a hit, as was pumpkin ale, raspberry was pretty sweet, some of the IPA’s very hoppy). I am by no means an expert, nor a big beer person anyway, but it made for a lot of discussion. Not finished with our day about town, we drove about a block away and joined a tour of the Lazy Guy Distillery. 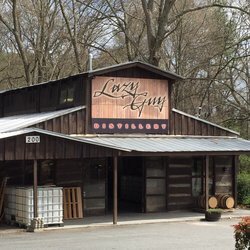 This is a great little whiskey distillery, right in town. Very informative tour was followed by a sampling of some of their whiskey and bourbon. Yikes, some of them had a definite kick of proof, but several were very smooth and others were infused with coffee, vanilla, cinnamon. How fun. Saturday tours are free, but if you pay for the tour you can take home a souvenir bottle of whiskey. Anyway, we had a good time playing tourists. Still need to go back and visit the Burnt Hickory Brewery and check out the Southern Museum of Civil War and Locomotive History (home of “The General”). How funny that you sometimes never check out what is right there in your own home town. And now it is Monday and I am NOT back at work (retirement is cool), just staring at a bowl of peaches that are in need of peeling and slicing. Hmm. There is a package of pie crusts in the fridge along with some fresh blueberries, so today’s adventure is making a peach and blueberry pie. 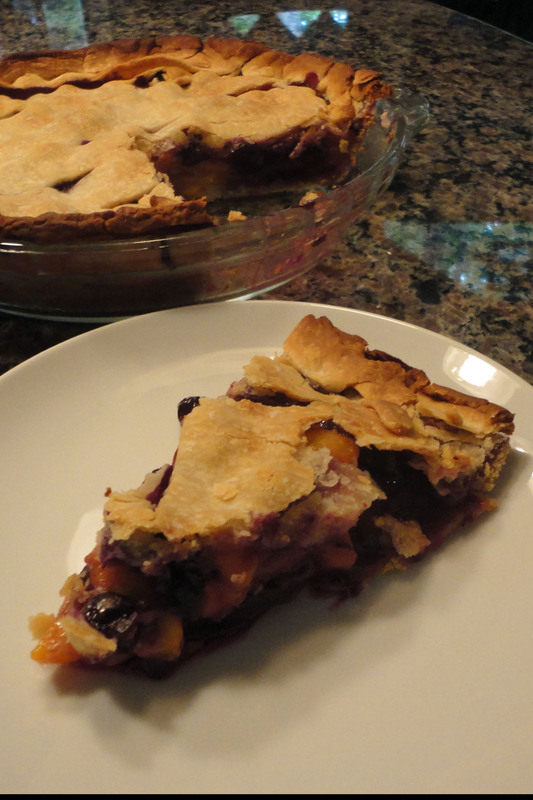 It was five cups of fresh peaches and blueberries with some flour, lemon juice, cinnamon and stevia inside two refrigerated pie crusts. The result was amazing for my first effort, and it was OK to have a piece at lunch, since I did my 4 mile walk already this morning. Too bad the picture isn’t scratch and sniff, cause it was good. Terri Steiner and her husband are playing at Burnt Hickory Brewery this Saturday at 12:30! They are called “Blind Fate” and are really good- you should check them out! Gosh you are right, I have missed their other appearances. Heh, and we just ran into Terri at Aldi’s on Sunday.